Mossos d’Esquadra involved in yesterdays operation lead a suspect away from the scene EFE. 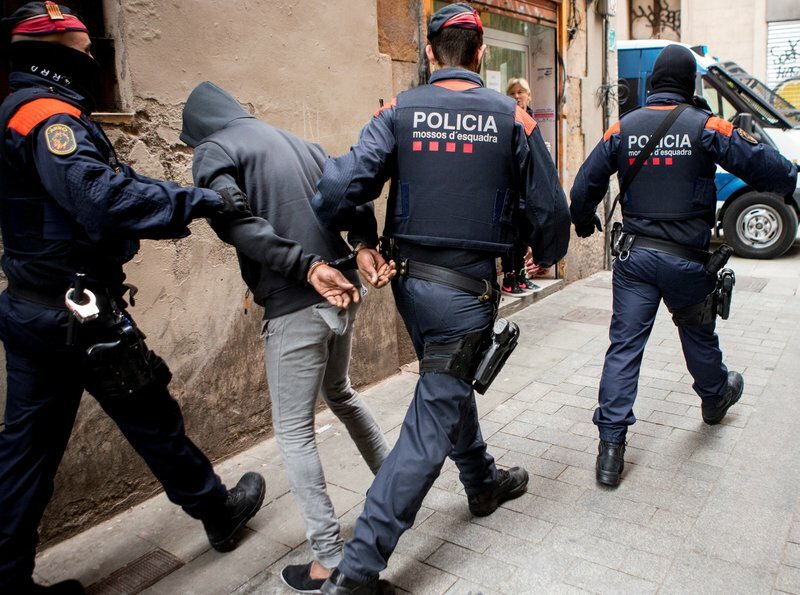 More than 800 police officers, including Mossos d’Esquadra and Barcelona’s Guardia Urbana were involved yesterday on a raid of some 40 suspected drug-flats resulting in the arrest of 55 people. The operation was the culmination of months, and in some cases, years of investigation. The raids took place in the capital’s Ciutat Vella district, and more specifically in the Raval district, which has become a major headache for police and residents in recent months in Barcelona. The flats were found to be points of sale, distribution and consumption of narcotics that are undermining the safety of the area and which are organised by one of the clans of Dominican origin which are presently involved in a fight to control drug trafficking, especially in heroin, in the Catalan capital. The police lockdown from the early morning was compete, and a helicopter hovered overhead throughout the operation under the orders of the investigating judge who had opened the case two years ago. Surprise entry was made to 26 previously-vacant flats which had been taken over by squatters and turned into drug flats. Likewise, 14 more searches were carried out in the Poblesec, Nou Barris and Badalona areas which according to sources have been used as distribution centers. In the past, neighbourhood groups had attempted to close some flats in the face of violent response from traffickers. Mayoress Ada Calou and Interior minister Miquel Buch appeared before the press and apologised for “difficult times” and increased insecurity residents in the area had endured in recent months. More arrests have not been ruled out.